Where should colleges draw the line? 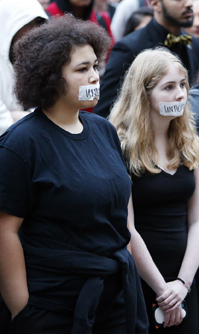 Several recent incidents in which college students spewed racist or misogynistic language on campus have renewed debate about how much freedom of speech the U.S. Constitution actually permits. Among the most notorious examples: the singing of a racist chant this year by several University of Oklahoma fraternity members. College presidents at Oklahoma and other campuses have swiftly disciplined students for speech deemed inappropriate, but civil liberties advocates say college officials are violating students' First Amendment rights to free speech. Meanwhile, critics say a small but growing movement to give students “trigger warnings” about curriculum material that might traumatize them indicates that colleges are becoming overly protective. American universities also have come under fire for accepting money from China and other autocratic governments to create overseas branches and international institutes on their home campuses. Defenders of such programs say they are vital for global understanding, but critics say they may compromise academic freedom.